and they were great. I had just enough materials left over from previous recipes so it was perfect. Then whisk the flour, baking soda, and salt together. 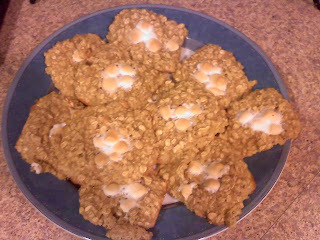 Stir in the oats, and marshmallows, if using them. Bake them for 8 to 10 minutes (your baking time will vary, depending on your oven and how cold the cookies were going in), taking them out when golden at the edges but still a little undercooked-looking on top. Let them sit on the hot baking sheet for five minutes before transferring them to a rack to cool. OMG! I need some NOW! Fuuuck, I dont bake! Bring me some??? ?